Castle Mey was the favourite home of the Queen Mother when she visited Scotland. So when we travelled to the north of Scotland, we paid a visit to the Queen Mother’s favourite residence, the only home that the Queen Mother owned in her own right. Located between Thurso and John O’Groats, Castle Mey is the northern-most castle on the UK mainland. On our travels around Scotland the weather ranged from intermittent grey skies to rain and sunshine. Thankfully, the sun shone for us during our stop at the Castle of Mey. We were fortunate to be able to see the castle, in its magnificent setting on the Caithness Coast, in the brilliance of the late afternoon light, and to have photos with blue skies. Castle Mey is not a big castle. Walking through some of the narrow corridors and spiral staircases, it became clear why our group of forty had to be split into three smaller groups. Our visit began at the walled garden, which was much loved by the Queen Mother. Behind the protection of the Great Wall of Mey is a beautiful and traditional Scottish garden full of lovely and interesting flowers, fruit trees and herbs. All throughout the garden, the Queen Mother’s personal touch can be seen, from the greenhouse to the floral displays in the Shell Garden where she loved to sit – you can see Tony taking snaps of the Castle from the Queen Mother’s favourite bench. The garden is very much a working garden and during the Queen Mother’s summer residence, it provided the fruit and vegetables for the kitchen as well as the flowers for the castle. The gardens are definitely worth visiting and our only disappointment was not having more time to appreciate the hundreds of species of plants and beautiful flowers in it. Castle Mey is a historic castle with spectacular views across the Pentland Firth towards Orkney. Built in the late 16th century by George Sinclair, the 4th Earl of Caithness, it was occupied by his descendants for over 300 years. The last Sinclair to live at Castle Mey was the 15th Earl of Caithness. When he died in 1889, the castle was bequeathed away from the Sinclair family. Queen Victoria bought it in 1952. She fell in love of Castle Mey at first sight. When the Queen Mother bought the castle, it was in a bad state of repair. After significant reparation works, she created a much loved holiday home which she returned to every year until her death. Today, the castle is still kept in the same way that the Queen Mother had left it. On our tour of the castle we caught interesting insights into her personality, interests and love of life. The Queen Mother was known for her tacky tastes and the collectibles in the castle bear witness to this. The castle has a very homely feel, rather than a grand castle atmosphere and it very much reminds of how one’s granny’s home might be. The knowledgeable guides make the visit quite enjoyable. Castle Mey is held by the Queen Elizabeth Castle Mey Trust of which Prince Charles is the President. The Queen wanted the castle to be maintained by the Trust for the benefit of the local community. We were not allowed to take pictures of the rooms of Castle Mey, apparently for security reasons, as the royal family still uses this castle. 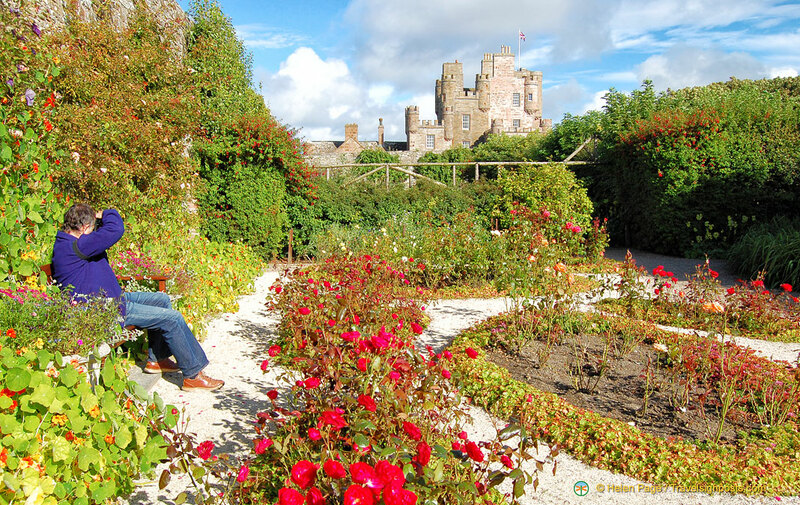 However, we can share with you some other photos of Castle of Mey Gardens Here. Please check for typo’s including the date of Queen Victoria’s widowhood. Thanks. Thanks for taking the time to point out typos which I’ve corrected. Many people have probably seen the stunning Castle of Mey from the outside, and even those that have not had the chance to personally visit Caithness have probably seen photos of the Castle. However, not many people have had the chance to see the Castles interior. It would have been great if you had also taken pictures of the castle while inside. Thanks for your comment. If you read the last paragraph of the post it does say that photography is not allowed inside the castle.